We spend a good amount of money on curriculum each year, so naturally we want it to be a great fit for our homeschoolers. But what happens when it’s not? 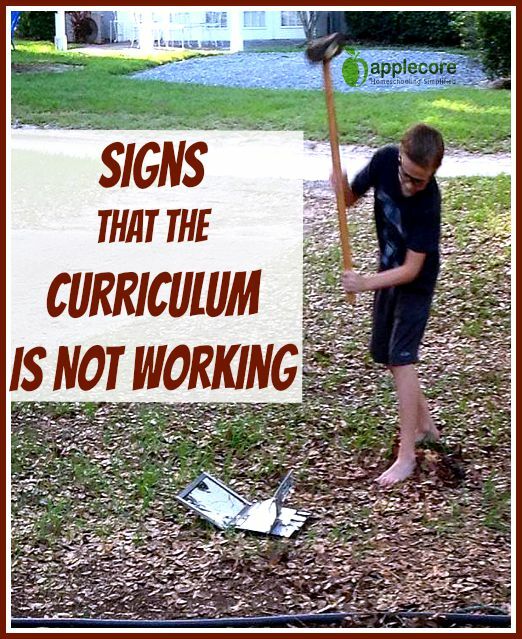 What are the signs the curriculum is not working? 1. Tears. When your child cries more tears of frustration than tears of joy, it might be a sign the curriculum is not working for them. 2. Anger. When your child is angry that they can not comprehend the material and start to withdraw or shut down, it might be a sign the curriculum is not working for them. 3. Confusion. When the lessons turn too long and produce more confusion than understanding, it might be a sign the curriculum is not working for them. 4. Miss. When the curriculum is not missed and everyone hopes it is forgotten for the day, it might be a sign the curriculum is not working for them. 5. Dust. When the cover accumulates more dust sitting unused, it might be a sign the curriculum is not working for them. Keep in mind – one bad lesson does not ruin an entire curriculum. Press through the tough new things. My oldest son would say, “this is hard” and I would correct him, “no, this is new”. New naturally feels difficult. However, if lesson after lesson you and your student are both miserable, why press through just to finish the book? You have the opportunity to try different things. Sell the curriculum and find something that fits their learning style! I always keep an eye out for Black Friday sales or random company sales if we are struggling with certain material. Another thing mom, it’s not your fault. I would be so hard on myself thinking I was a bad homeschool mom because we tried 3 different math books in 2 years. Each subject, each book, each lesson is written by different people with different learning styles than your unique homeschooler. Do not take it personally. Find something that works and then enjoy the rest of the school year!